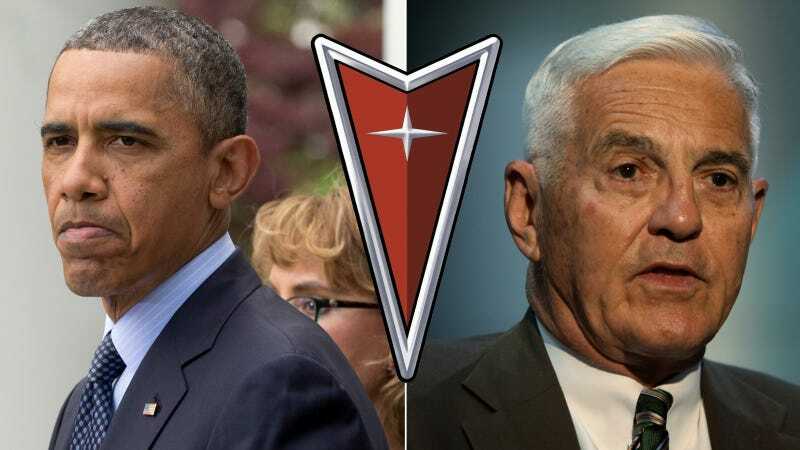 Over the weekend, former General Motors Vice Chairman Bob Lutz dropped a bombshell on car enthusiasts and policy wonks when he revealed for the first time that the federal government told GM to drop Pontiac or they wouldn't get a bailout. Enthusiasts may balk, but this was the common sense idea — and even GM knew it. In fact, while Lutz's remarks were the most frank and revelatory comments about the demise of Pontiac as it related to the bailout to date, they really shouldn't come as much of a surprise. At the time of the bailout, even GM alluded to Pontiac's woeful status in the marketplace, even if they never came out and admitted that the bailout was dependent on its closure. Of Lutz's remarks this weekend, GM spokesman Greg Martin said this: "Bob is entitled to his opinion. We are selling more cars today with four brands than with eight, and we are focused on the future, not the past." Even so, today's car aficionados still wonder this: Why did GM kill Pontiac and Hummer and sell Saab, but keep GMC and Buick? The answer is that the first three were not profitable and viable in the marketplace, while the last two were. It's really pretty simple. GM knew that, but it took their taxpayer-funded saviors to get them to euthanize some of their flagging brands. Context is important when we talk about the death of Pontiac. Today, GM includes Chevrolet, Cadillac, Buick and GMC, but the company was once vastly more prolific than that. This setup goes back to longtime GM president Alfred P. Sloan, who famously said his company offered "A car for every purse and purpose." But as early as the 1960s, the lines between the individual brands began to dissolve. Soon there was little to differentiate Pontiac from anything else besides marketing and body cladding. This loss of identity, combined with GM's famous infighting between divisions and badge engineering, began to make "A car for every purse and purpose" a liability rather than a feasible strategy. Flash forward to late 2008 and 2009, the peak of the recession, in which a debt-mired GM — which posted losses of $38.7 billion in 2007 — projected it would run soon out of cash without an infusion of taxpayer money. And so a task force from the U.S. Treasury Department worked with GM executives on a plan to bail the company out while also restructuring it not to repeat the mistakes that had put it in this situation in the first place. One of the better accounts of the bailout of GM (and Chrysler) is the 2010 book Overhaul, written by Obama administration car czar Steven Rattner. Here's what he wrote about the decisions which brands to keep and which ones to kill, starting with the "two-brand" option of just Chevrolet and Cadillac that Lutz alluded to in his interview. The two-brand option was the first to fall by the wayside after analysis showed that the GMC name was too valuable to jettison. GMC trucks are essentially the same as Chevy trucks, yet they fetch several thousand dollars more per vehicle. Whether to keep Buick was a much tougher call. To GM's thinking, Buick was needed as an intermediate step for buyers trading up from a Chevrolet and not yet ready for a Cadillac. But our team had trouble seeing this borne out by marketing statistics, and Buick had a very thin product line. And then of course, Rattner said, was the fact that Buick was selling strongly in China. But he said government officials weren't entirely convinced that justified alone saving Buick, as they were unsure whether buyers in China really cared if the brand still existed in the U.S. or not. More importantly, he wrote that their decision was more about car dealers than China. The trickiest aspect of Buick for us involved dealers. Modern car dealers typically carry multiple brands, and within the GM universe this meant there was a whole cadre of franchisees selling Buick, Pontiac and GMC. Taking away Buick on top of Pontiac would leave those dealers only with GMC. We couldn't compensate them by adding Chevrolet to their mix because that would cannibalize their GMC truck sales. Nor could we offer them Cadillac; with its upmarket position, the fit wouldn't be good. If nothing else, this exercise illustrates just how crucial truck sales truly are to GM. Rattner's book never explicitly says what Lutz claimed: that the feds came out and said straight-up they didn't want Pontiac. He does say that by April 2009, a plan was moving forward that did not include Pontiac, Saturn, Saab or Hummer. But news stories at the time noted, if not as directly as Lutz did in 2013, that GM knew Pontiac was on the ropes. GMAuthority also notes that Pontiac was selling what were essentially re-badged Chevrolets at sub-Chevrolet prices, which lost money for them and hurt Chevy as well. There has been a lot of talk over the past few days about how "Obama killed Pontiac," maybe because he hates rear-wheel drive cars or because he only wants environmentally friendly vehicles like the Chevrolet Volt. But the truth is much simpler and colder than that. If there was ever a brand with an overinflated reputation in the minds of the car-buying public, it was Pontiac. As Mike opined this weekend, Pontiac treaded for years on Boomers' memories of Firebirds and GTOs while the overwhelming majority of their modern offerings were garbage — rebadged Chevrolets like the G3, G5 and Torrent that hurt GM as a whole and lost money. Killing Pontiac wasn't the right move, it was the only move. After all, we're not just talking about "saving" a car company. We're talking about injecting it with $49.5 billion in taxpayer money to hopefully save scores of jobs at GM, related suppliers and the rest of the auto industry. There was no room for potential failure here. Yes, many of GM's newer products, like the Cadillac ATS and CTS, Corvette Stingray and Chevy Impala are very good, but Government Motors still meant a $10 billion loss for taxpayers. Towards the end of Pontiac's life, Lutz tried as hard as anyone to re-inject some true excitement into the brand with cars like the Aussie imported GTO, the Solstice roadster, the G8, and the planned G6 that was to be a budget version of the Cadillac ATS. Lutz's plan was ambitious and appealing to us as enthusiasts, but there was no guarantee it would work or, more importantly, be profitable. Remember, journalists loved the G8, but no one actually bought it. And what if their blue collar ATS had been a hit? Wouldn't that possibly have cannibalized more profitable sales of the Cadillac version? At the end of the day, this was just more badge engineering, and what did that really ever do for GM? Pontiac didn't make any business sense for decades and it still didn't right up until it was put to sleep. As great as this "American BMW" idea would have been, Pontiac didn't deserve another chance, and certainly not one funded by taxpayers.